If the U.S. had not dropped atomic bombs on Hiroshima and Nagasaki, the Allies had plans to invade the Japanese home islands. The first step, Operation Olympic, would have been the seizure of the southern part of Japan's southernmost main island of Kyushu (most of Miyazaki and Kagoshima Prefectures) before the second step, Operation Coronet, would have involved the landing of troops to gain control of the area around Tokyo. The alternative history Death is Lighter than a Feather, originally published as Lighter than a Feather in 1971, covers the period from the Operation Olympic American landings on Kyushu starting November 12, 1945, until Japan's surrender on January 14, 1946. The title comes from the first precept of the Imperial Rescript to Soldiers and Sailors, "Be resolved that duty is heavier than a mountain, while death is lighter than a feather." David Westheimer's most famous novel is Von Ryan's Express, published in 1964 and made into a movie in 1965 starring Frank Sinatra and Trevor Howard. 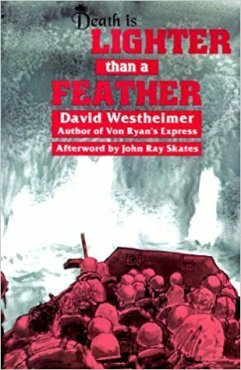 Westheimer did extremely thorough research to write this novel with a high level of accuracy and authenticity in culture, geography, and possible historical events based on Allied invasion plans. After a long Prologue that presents what happened between early August 1945, when the U.S. did not drop the atomic bombs, and the start of the invasion of Kyushu on November 12, each of the novel's eighteen chapters has a short story with characters on both the American and Japanese sides. At the end of a chapter, the main character generally but not always meets death. Most of the short stories are independent from others and could be read separately, but together they connect effectively to depict realistically what could have happened, including the confusion and isolation of many of the combatants. The chapters are sequenced in roughly chronological order. The dialog is convincing, although one chapter has a long conversation between two concealed Japanese soldiers in the midst of a battle, which seems to be impossible due to the noise and confusion around them. The realistic characters on the Japanese and American sides make this book exceptional. The author presents a wide variety of average people, some with typical human weaknesses and some with quirks. Several chapters begin with summaries of the overall status of the Kyushu invasion. The book does not deal at all with high-level leaders, but rather with regular people who are fighting or often waiting apprehensively for the fighting to begin for them personally. The Japanese side has few top-notch soldiers left after fighting the war for so long, so several characters are women or older men, fearful and starving, who have been forced to join the National Volunteer Combat Force. They recognize the situation as hopeless, but almost all continue to battle the enemy until death. The author supplies enough history and details about these characters so that readers can relate to their feelings and understand their actions. Kobayashi [name of small airstrip] was even more trying than Kanoya, for at Kobayashi there was nothing to do but wait. And the waiting would only end in death. Many of the kamikaze, Hiroshi among them, spent much of their idle time writing and rewriting their last letters home. Hiroshi worked at his until he was sure it expressed the thoughts expected of a true son of Japan. It was not genuine but it would bring comfort and honor to his father. He was determined his actions would not tarnish the false image it created. Chapters 3 and 4 present a kaiten human torpedo pilot who hits an American transport. He went out on two prior missions but returned alive each time in humiliation when his kaiten was not launched.